Germany has remained one of the most powerful countries in Europe, and remains an interesting country to visit - a place where Western and Communist values have been reconciled, with democracy and free enterprise winning the race. Germany, in the post-reunification era, is much different than Bob remembered it from the Cold War days. Berlin was accessible by road (vs. darkened night train) and Checkpoint Charlie is now a museum, the prior East Germany was vibrant, although lagging economically, and the country is struggling with the debt of reunification. Some things haven't changed though, the Hofbrauhaus in Munich still rocks to the Oomph bands, (although the frauleins serving beer have been replaced by men from Eastern Europe or the Middle East) and towns and streets are still neat and tidy. Berlin still bears scars from World War II - the main cathedral remains bombed out just as it was at the end of the war. The rest of the damage has been cleaned up and the city restored, but now scars from the Cold War remain - museums and memorials to the Berlin Wall and those who tried to escape. We found the center of East Berlin still somewhat seedy, with cheap shops and skinheads hanging around Alexanderplatz. 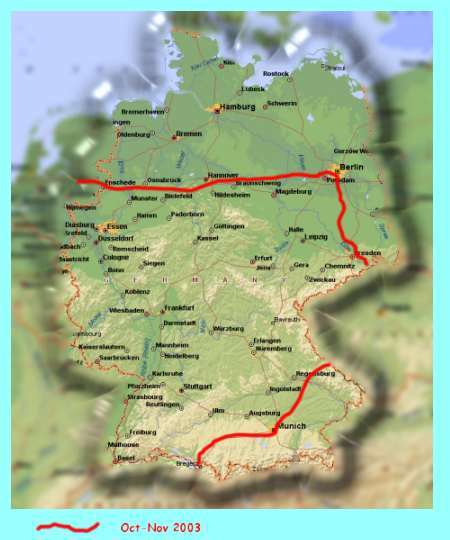 Public transport was good and access to our caravan park in nearby Potsdam was good. South to the Dresden area, we stayed at a caravan park owned by an enterprising young couple who provided all of the amenities that we could want - plus good advice on places to see. Craftsmanship remains high in what used to be Eastern Germany and we spent a day wandering through a Christmas shop and loading up for future Christmas'. Guten Morgen earns you a reply in the morning here, just as it does in Austria.